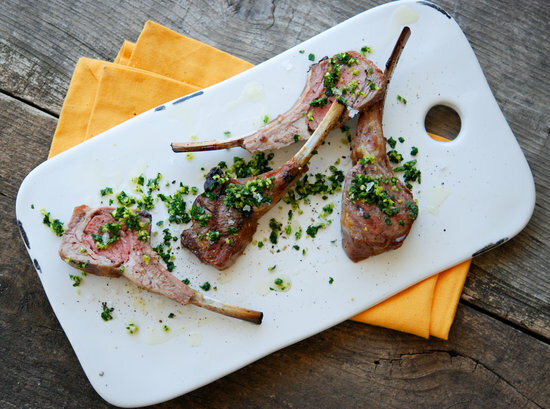 I know, I know, I should have posted this before Easter, but lamb with gremolata is lovely all spring (year) long, so make it this week instead! I had let gremolata – a relish of minced lemon zest, garlic, and parsley – slip out of my rotation but it’s back with a vengeance, thanks to helping out at a Cooking the Market class at Kitchen in the Market last week. Have you ever taken a Cooking the Market class? Led by co-owner chef Molly Herrmann, the classes are pure improvisation, cooking with imagination and instinct, the perfect cooking class in my mind because it captures exactly the joy (and reality!) of cooking at home. Molly leads the class through a tour of Midtown Global Market, pointing out potential ingredients from The Salty Tart, Holy Land Market, Grassroots Gourmet, Produce Exchange, and El Burrito Mercado. The goal is to step out of your comfort zone and experiment with new ingredients while a chef provides guidance and assistance. Add music and wine and you’ve got a winning evening out with friends, coworkers, or family. You may have had gremolata atop osso bucco, where its bright, fresh zing is a traditional contrast to silky braised meat. But you don’t have to think hard to imagine that it is just fabulous tossed with warm (or cold) new potatoes with olive oil, or spooned over a pan of sautéed peas, or swirled into soup, or sprinkled over seared fish…on and on. Add mint if you like – terrific with lamb, of course – or shallots instead of garlic. Some recipes call for adding anchovies which would probably make the best egg salad sandwich ever (still have Easter eggs to use up?) For me, when spring is frustratingly near but not yet quite here, punches of color and zest are not just welcome, but essential. Sprinkle lamb chop pieces all over with kosher salt. Adjust grill so heat is high but chops can be grilled over indirect heat. With a gas grill, leave a couple of the burners on high and turn one off. With charcoal, push embers off to one side. Grill chops away from the heat source, about 4 1/2 minutes per side, for medium (pink not red). 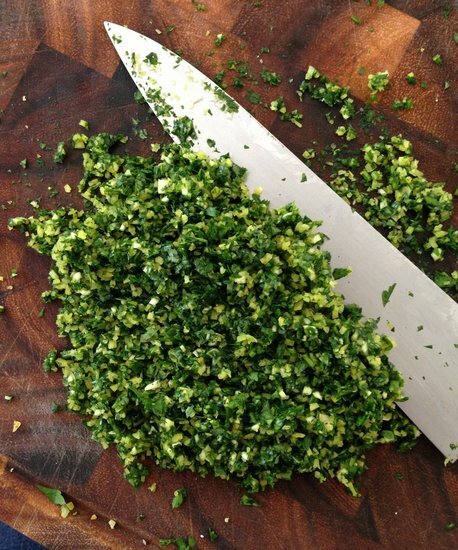 Transfer chops to a cutting board and let rest while your prepare the gremolata, 10 minutes. Carve lamb chops in half. 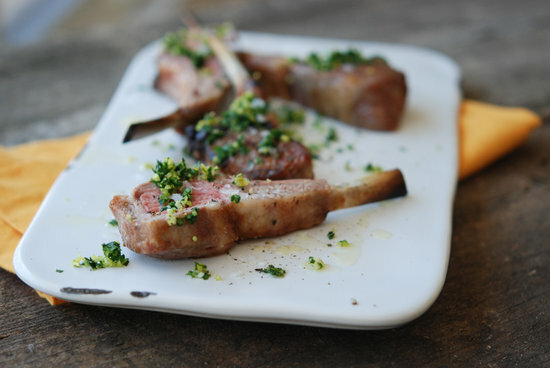 Top with gremolata and a drizzle of olive oil and serve immediately. Finely chop the lemon zest. Pile on the parsley, chopped garlic, and kosher salt and keep chopping, all of them together, until gremolata is finely minced and uniform. Cover and chill leftovers for up to a week. « Froz Broz Caramel Popcorn Candied Almond Ice Cream…YES!